Library patron Andy Buchanan uses one of The Community Library’s Internet computer stations Wednesday. 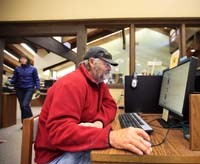 Ketchum residents searching for reliable and free Internet access—especially since the Ketchum Urban Renewal Agency’s Sept. 17 decision to discontinue its Ketchum Wi-Fi network—need look no further than The Community Library. The newsletter states that users of the library’s Wi-Fi network can connect to the library’s printers through their Wi-Fi devices. As with all library services, access to the library’s Wi-Fi network and printing are free, the newsletter states. Aaron Pearson, the library’s information systems director, said that for users who do not own their own computers or other Wi-Fi devices, the library has 35 public computers available, all of them equipped with up-to-date versions of Microsoft Office and various web browsers. Pearson said those computers are used on average by about 100 people per day, but that can go up to about 200 during peak season. Pearson also said the library’s Internet connection—which is directly linked to a Syringa Networks high-speed fiber optic line—has a capacity to increase as needed up to 100 megabits per second. Syringa Networks is a Boise-based firm that provides network infrastructure and Wide Area Network services to the Wood River Valley.